Our home is our castle and it doesn’t matter where we call home, whether it’s an actual place, or just a feeling, like with all matters of the heart, we know it when we find it. However, finding a place to call our home must be one of the best experiences in life, surely!? There’s only two places we’re meant to get proper peace, that’s the grave (well, that got morbid quickly!) and our own homes. But that doesn’t mean that it has to be boring in anyway, far from it! 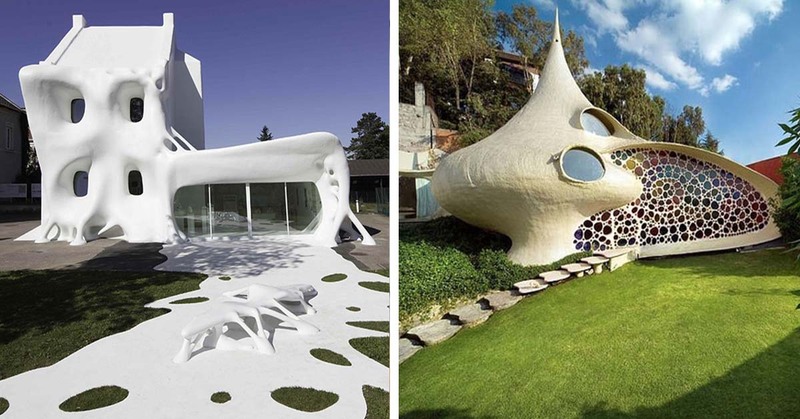 So, if you’re looking for a new home and are looking for something a little ‘different’ and ‘wacky’, then look no further and take some “decoration-inspiration” from our list of weird and wonderful houses from around the world! 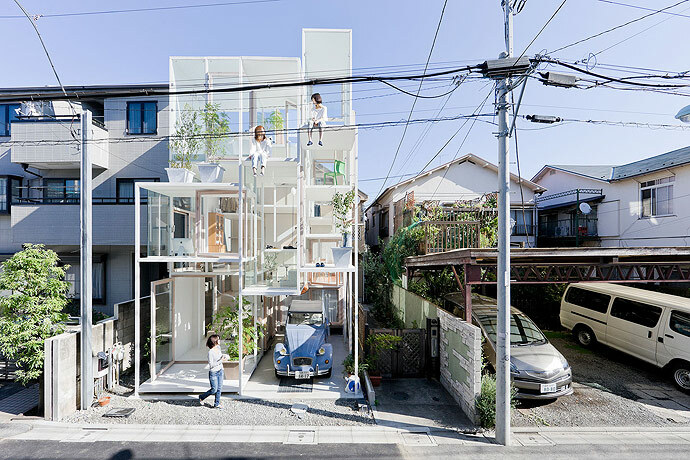 This little, adorable, claustrophia inducing home is just 122 centimetres across at its widest point. It is the brain baby of Polish architect Jakub Szczesny. It’s beautiful and everything, don’t get me wrong…but from someone who gets claustrophobic just from being in the shower…I don’t think this one is for me! Probably not the best choice of home for someone who is scared of air travel…but, come on, how cool would it be, to say that you lived in an airplane!? That’s got to be some childhood dream come true!? Imagine coming home to this one drunk out of your mind!? You’d think you’d lost your head! & It’s not just the outside that’s on it’s head! The inside is all topsy turvy too! It’s awesome and everything, but it’s giving me a migraine just looking at it! Every little child’s dream home! I think this is absolutely beautiful. Apparently it’s also kitted out with all the mod cons, (hot water and the like) and even boosts a roomy interior, with a king size bed! When I can I move in!? Errrm, I can’t imagine what kind of eccentric person you’d have to be to want to live in a toilet, but wow…it’s pretty impressive, I have to say! This lavatory based accomodation was the idea of the Mayor of Suwon Sim Jae-Duk and was to commemorate the founding of the World Toilet Association. Well…at least it had a purpose…but at a cost of of $1.1 million to build, I can’t help but feel that it was money down the cr*pper! 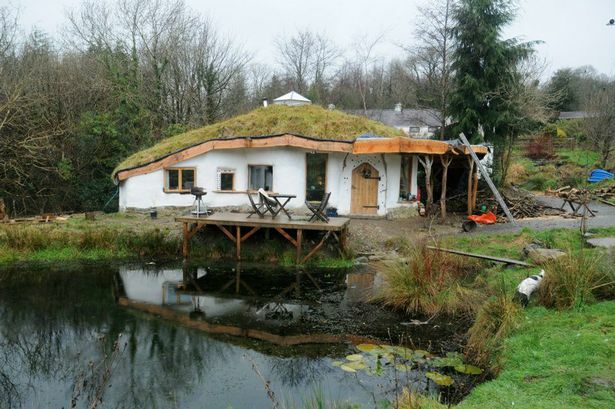 This adorable little home was built by Simon Dale in 2003, after he wanted to create an eco friendly, simple living home for himself and his family. Obviously a Lord of the Rings fan too! I’ve never even seen the Lord of the Rings and I’d still kill to live here! How cute!? Wow, can’t imagine this home would be big on privacy… (no more walking around the house naked, that’s for sure!) even the bathroom is on full display. It’s beautiful yes, but I don’t fancy people watching me going for a tiddle! Very unique and probably not everyone’s cup of tea, but I think it looks like something out of ‘A Bug’s Life!’, it’s adorable! It was designed by a guy named Senosiain Arquitectos and it draws a lot of curious tourists from all around the world, and rightly so! This eccentric, gorgeous home was built by an architect named Terry Brown, and it is located in the Hyde Park neighbourhood of Cincinnati. As if the outside wasn’t a big enough feast for the eyes, inside it features pressed copper ceilings and a spiral staircase entry. What a fairytale house! Snow White DEFINITELY lives here! 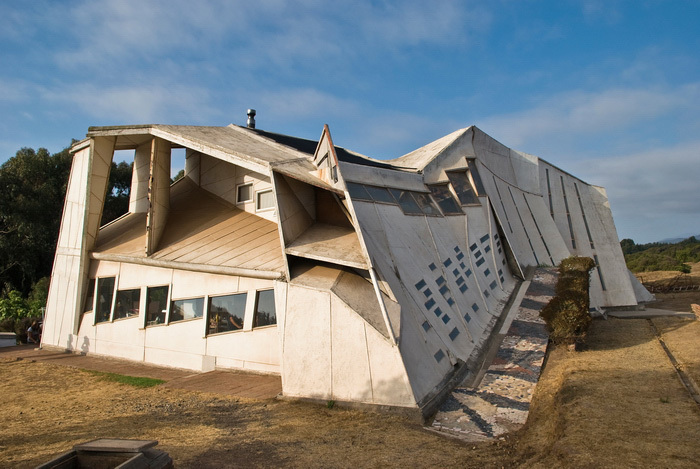 This vertigo inducing home is another one you wouldn’t want to come back to slightly tipsy, it’s making me dizzy just looking at it, but regardless, it’s eccentric style is still one of the most popular tourist destinations in Chile! Put the kettle on, ma! I’m home! 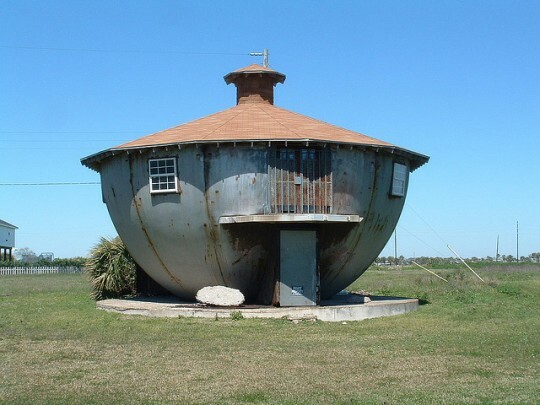 Tiny but tough, this home brew house is totally hurricane proof and is also one of Gavleston’s most notable land marks! Cute! WOW. I’m completely and utterly in love with this place already! Talk about living in a fairytale! Of course, it’d have to belong to Minnie Mouse in the Magic Kingdom… and is a every Disney fanatics dream! Yabba-dabbo-doo! This house is ace! 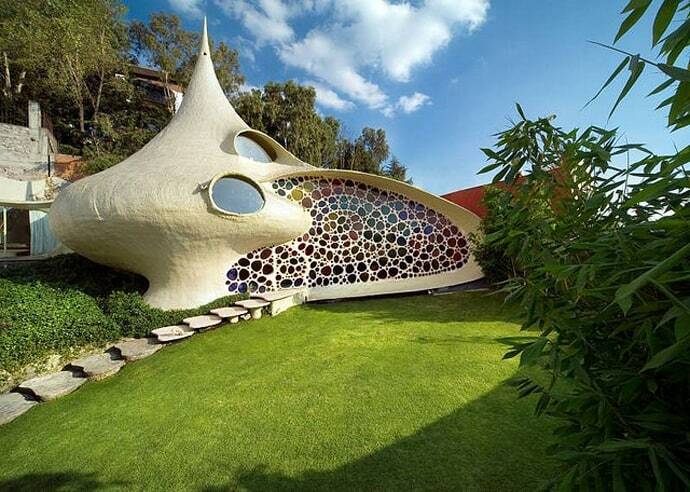 It’s worth a cool $3.5 million and is an exact replica of the house owned by the Flintstones family in the popular 1960’s cartoon series! Utterly amazing! 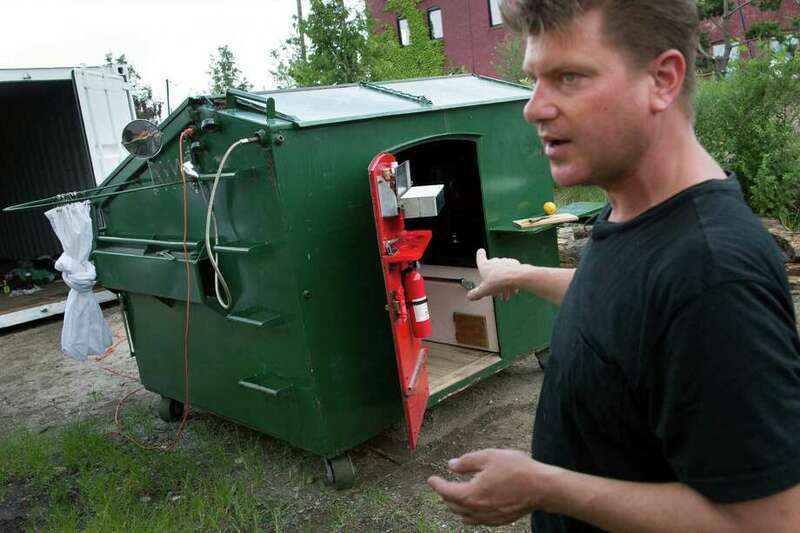 Just because you live in a dumpster, doesn’t mean it has to be rubbish! (Bad pun, sorry!) This tiny home is the brain child of californian designer, Gregory Kloehn and it actually provides him with all he needs to live comfortably! That’s one way to beat the house prices in NYC! The house of your dreams…IF…. you’ve ever one one of those dreams where everything is a bit mishapen and squashy, and you’re not quite sure why? 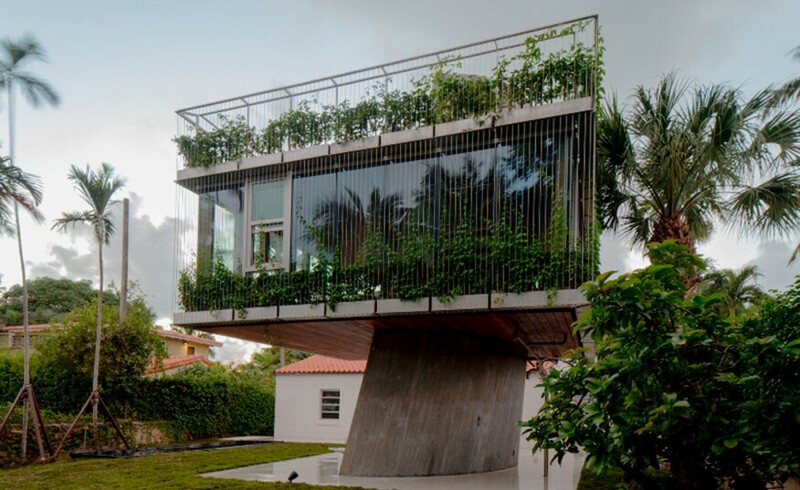 This wacky abode was designed by architects Berdaguer and Pejus and is actually a renovated prison house! Well….it’s certainly eye catching, I’ll give them that! Which one was your favourite! ?